Lloyd, Dan and Paul MacDonald from Cape Breton play the castle in Baltimore. BALTIMORE, West Cork -- It was my second year in a row visiting this lovely scenic part of Ireland coinciding with the 19th annual Baltimore Fiddle Fair (May 5-8) that takes over the seaside resort village just outside of Skibbereen every May. Last year the weather was more cooperative for my tourist tendencies, and this year my focus was on soaking up all the wonderful music on offer during the four-day festival that has an alluring laid-back quality that reflects the temperament of West Cork in general, a destination for many international visitors. As readers of this space know I love Irish festivals big and small, but especially those that are well crafted along traditional music veins. This one is curated by one of the more knowledgeable and insouciant directors in Baltimore resident Declan McCarthy. Along with his family, whose pub served as the wellspring for the festival 19 years ago, it still feels like a McCarthy family party where weekenders are welcome and treated to some of the finest talent in the Celtic music world. The Fiddle Fair is a small, intimate festival with big names happy to perform here because of the location and ambiance. This year’s slate of performers included Matt Cranitch, Jackie Daly, Phil Cunningham, Aly Bain, Dermot Byrne, Dezi Donnelly, Jim Murray, Paddy Cronin, John Doyle and Liz Carroll who would be well known among Irish audiences, most of whom are popular returnees to the event. Returning this year were brothers Dan and Paul MacDonald from Cape Breton who brought along their fiddle-playing father who was a very youthful 80 years old. Adding some blue-grass and old-timey American roots music were the Foghorn Trio from Portland, Oregon, and a young fiddling duet, Cleek Schrey (Virginia) and Stephanie Coleman (Chicago) who brought along the talented Michigan percussive dancer Nick Gareiss. There was also some eclectic group music from the Moulettes and Majorstuen, a string fiddle ensemble from Norway for more variety and exposure. All this talent was gracefully interwoven and balanced throughout the weekend in a variety of settings in concert or workshop mode filling out the days and nights in a manageable fashion. Rising above them all is the Dun na Sead Castle built in 1215, painstakingly restored as a residence for another McCarthy family who turn it over to Declan for concerts each year in a magnificent and totally acoustic fireside room. In fact the weekend started with a Thursday night candlelight concert with Cranitch and Daly, with highlights from their Living Stream CD bringing a bit of Sliabh Luachra to these parts. Another Sliabh Luachra legend in 86-year-old Paddy Cronin gave a Saturday afternoon recital in the castle overlooking Baltimore Harbor that lasted two hours non-stop. It gave ample evidence of a still skillful Gneeveguilla native who was a student of Padraig O’Keeffe. On Sunday afternoon the MacDonald clan delighted another full house with Cape Breton tunes and yarns from their homeplace that had so much in common with the ethos and camaraderie that define the Fiddle Fair community. 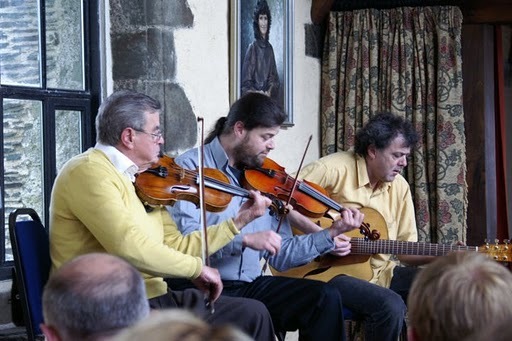 The main concerts take place in the Fiddle Fair marquee on the grounds of Casey’s Hotel, whose nearby bar is well-tended by Michael and Anne Casey with plenty of room for post-concert sessions by the advertised talent and many who turn up for the craic. Throw in some lovely sessions on the square outside the Bushe’s and Jacob’s Bars and the Algiers Inn around the corner, and time and cares of the outside world are notions best forgotten -- though these days, Internet access can allow for some virtual reality to creep in for those who may want to reach the outside world without leaving the comforting embrace of Baltimore. Next year will mark the 20th anniversary of the Baltimore Fiddle Fair, and Declan McCarthy promises it will be a very special celebration looking back over the years. It would include a photographic book by Con Kelleher, who had documented many of the annual events in pictures and a special CD as well will be compiled. Scheduled for May 10-13, you can keep your eyes peeled for details at www.fiddlefair.com or on Facebook under Baltimore Fiddle Fair. EVEN though I was 3,000 miles away in West Cork, the news from the Catskills came to me at intermission of a beautiful concert by Matt Cranitch and Jackie Daly. Facebook delivered the stunning news that the colorful East Durham Irish pub owned by Tommy and Yvonne Furlong would not be opening this season and would soon to up for sale due to an illness in the family and the inability to operate it in the fashion in the manner for which they were famous -- world renowned even. The blow was softened somewhat coming from Matt and Jackie, who made Furlongs their lair during the annual Catskills Irish Arts Week these past seven years as if it was a five-star resort, and other teachers vied for the chance to bunk in there as well. Like so many others they grew very fond of the owners Tommy and Yvonne, who created an atmosphere in their pub that made it epicenter of the Catskills week and the unofficial “festival club” while the week played out every year. It served as an international crossroads where friendship and frivolity -- along with the non-stop music -- not only greeted you at the door, but on the porch and backyard and the roadside marquee they proudly outfitted every summer with a Guinness trailer and BBQ grill making it everyone’s last stop each night. Right now the thoughts and prayers of many are with Yvonne and Tommy, who suffered a debilitating stroke just after New Year’s, so coming to this decision must have been very difficult for the couple who worked so hard to keep East Durham alive. They owned the place for 24 years, making it one of the most popular joints in the Irish American resort town as they creatively made the most out of the small motel and bar property. Choc-a-block with memorabilia from their own colorful lives and Irish Americana, the fictional TV show Cheers wasn’t a patch on the characters passing through the portals of the infamous pub on Route 145 anytime the doors were open for business, making for great conversation, jokes and slagging at all hours and music that delighted the crowds. So many great memories went through my mind in faraway Baltimore, and even though I knew of the vital importance of the Furlongs as craic central for the Catskills Irish Arts Week summer school, I was also aware of the many contributions it made to building up the magical week down through the years which could never be taken away. Cranitch and Daly holding court with their CD launch at the beginning of the week, and the young stars of NicGaviskey closing out the week with a CD heralding their very birth the year before in Furlongs. It would be hard to write a better script for the last year of Furlongs. For those who see it as another nail in the coffin of the Catskills, keep in mind that there are two new pubs plying their trade on Route 145 which will help keep hope alive there in the Irish American hamlet of East Durham. The Saloon (newly renovated and expanded from its old Darby’s days) and the Stone Castle Inn (formerly the Stone Tower Restaurant shuttered for well over a decade) which was beautifully restored will be open for business. Even more amazingly, from the September ashes has arisen a brand new state of the art Lodge building housing the Blackthorne dining hall, pub and resort office built in eight months and opened two weeks ago for the spring season as the Handel family predicted. This week it was announced that the GAA games from Ireland which were formerly shown in Furlong’s are also now on view at the Blackthorne (along with the M.J. Quill Centre locale as well). This weekend is their grand re-opening weekend and more info can be found at www.blackthorneresort.com. The Catskills kicks off with the big Memorial Day Irish Festival the weekend after next with lots of great talent, and details can be found at http://www.irishvillageusa.com/memorial-day-festival#.